If you’ve spent any time on social media in the past few years, you know how popular quizzes can be. Just about everyone is looking to learn what kind of cheese they are or what city they should really live in. However, quizzes aren’t just useful for finding out silly qualities you have in common with a Disney character. A well-structured quiz can be a powerful lead magnet. Using a quiz as a lead magnet is simple: all you need to do is require users to enter an email address opt-in to get their results. Because they’ll be invested in learning the results of the quiz, they’ll be more likely to enter their contact information. SkilledUp, an online course site, decided to implement a lead generation quiz and they saw over 1,600 new leads after just three months. However, you can’t create just any quiz and hope to see results. To create a high-powered lead-generating machine of a quiz, here are 6 important do’s and don’ts to follow. Your leads are participating in your quiz specifically to see what the outcome is, so you definitely want to get creative about the results you present. Within Thrive Quizes, you’re given three different options for quiz outcomes: a number, a percent, or a category. This means you can either present outcomes as the number of questions they got correct, display a percentage they answered appropriately, or use their responses to categorize quiz takers. Try to make responses fun so your lead magnet becomes irresistible. When leads are entertained by your results, they’ll think the time spent on your quiz was well worth it – and remember your fun and creative side. While quizzes can be a great way to capture lead attention, you still want to ensure those individuals are within your core target audience. If you create a quiz that is too generic, you may end up with a list of leads who will never convert into customers. That can be frustrating – and expensive – for you. Instead, keep your quiz topic framed around something relevant to your industry and target audience. A “how much do you know” quiz about a product or service you offer is a great way to capture high-quality leads. When using a quiz as a lead generation source, you want to prevent your leads getting bored as much as possible. If your quiz is too long, they may become distracted and quit before it’s time for them to enter their contact information. Complicated questions can also be distracting or annoying for your quiz participants. Keep your quizzes between 5 and 7 questions. That is ample opportunity to gather enough information about your participants without overwhelming your audience. A quiz and a survey may sound similar, but they have entirely different purposes. If you try and run your quiz the same as you would a survey, you’ll disappoint your audience and risk losing their trust. Your quiz needs to provide an outcome and response, unlike a survey. However, you can use your quiz to learn more about your target audience and quiz participants. By logging the responses from your quiz, you’re able to gain insights about the individuals engaging with your content. Based on those responses, you can then provide them with unique content tailored to their preferences. High-quality images are a great way to keep your quiz participants active and involved. Images are also easier to understand than text questions. Using images within your quiz whenever appropriate can help push your user through the quiz process faster. Instead of needing to read all the potential responses, they can simply select the image that speaks to them. Going back and forth between images and text can also keep your audience more engaged. The more interested they are in your quiz, the more likely they are to finish – and the more likely you are to capture their content information. Thrive Quizes and Gravity Forms quizzes only embed into your WordPress site. That means, if you’re not operating in WordPress, you’ll need to find an alternative option for creating quizzes. However, once your quiz is embedded on your page, you can then share it on your other platforms. That includes Facebook and other social sites. When selecting a platform for your quiz landing page, be sure it is compatible with your website host. If you’re looking to use a quiz as a lead magnet source, Automation Agency is here to help. 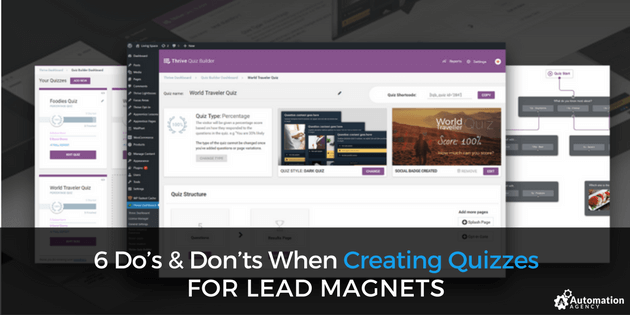 We offer solutions through both Thrive Quiz and Gravity Forms, and we can help you by creating a quiz lead magnet that pulls in high-quality leads ready to convert and embedding it on your website. If you’re an Automation Agency client, simply submit a task with the content you’d like us to use for your quiz, and we’ll get started!